Is the corporate grind and life in a cubicle getting you down? Ready for a little adventure and a fresh perspective on life? Have you dreamed of traveling the world, yet wonder how to do it without having $10K or $20K in your bank account? Nearly all of us have been there, yet few of us figure out how to set ourselves free from the grind of 9-5 office life and even fewer find the courage to embrace the challenges and adventure of actually taking on the unknown. Well, meet Christina Larson, a Kentucky girl who set herself free and discovered the world. From the ultra-modern thoroughfares of Seoul, Korea to the ancient caravan routes of the Arabian desert, Christina has traveled the world and lived a life that has taken her to 28 countries and countless adventures. How did she do it? She earned a TEFL certification and set out to teach English abroad. Christina grew up, like many Americans, in just one state, Kentucky. After graduating from college with degrees in Broadcast Journalism and Psychology Minor, she developed her passion for traveling during a 13-country, one-month tour of Europe. Following a stint in the corporate world that left her uninspired and living out of a suitcase for two years as a tour manager, Christina discovered the perfect avenue for recapturing her love of travel and for exploring the world - living life as a local in a foreign country teaching English abroad. After much research, Christina determined that the perfect way for her to work on her degree in Hospitality and Tourism Management, save money and travel at the same time was to earn a TEFL certification that would qualify her for thousands of jobs around the globe teaching English as a foreign language (TEFL). “A lot of employers wouldn’t even look at my resume without that qualification, and I was also very happy that I did it, because it refreshed my memory on matters like grammar rules, and how to put together effective lesson plans,” Christina recalls. With her TEFL certification in hand, Christina researched teaching opportunities around the globe and after many conversations with a TEFL advisor, she determined that teaching English in South Korea provided the best savings potential in addition to a fantastic international experience and great travel opportunities. Christina taught in Korea for two years, she worked from 8am-4pm, teaching 27 hours a week to elementary students, from kindergarten to 6th grade and managed to save about $1500- $1700 a month after expenses. But Christina's two years in Korea weren’t just about making money and working in the classroom, which she found to be tremendously rewarding. She was able to discover a totally new culture and make tons of friends, including many Koreans and other Americans and expatriates living in Seoul. “Korea was a fantastic experience and there are a million things to do. There were always people to meet, places to go…if I was bored one day, I could pick any part of the city and just wander, and discover new things. Seoul is exciting, and it’s hard not to get caught up in that. And I just loved the hustle and bustle of Myeong-dong during the shopping season, and searching for ‘Korean’ presents for my family in Insadong”. Saudi Arabia Time! Love time! 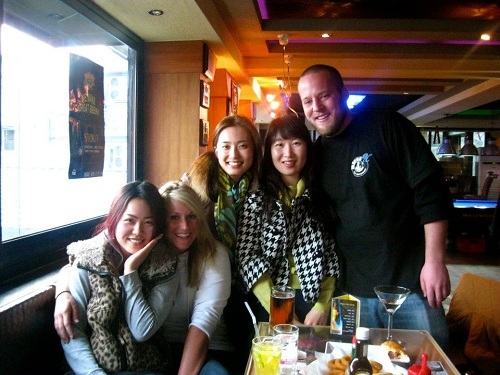 After two years in Korea, Christina decided that her adventure teaching abroad wasn’t over. She chose to teach English in Saudi Arabia because it provided some the best salaries in the Middle East, new opportunities for adventure and travel, and new challenges, including adapting to life in a conservative Islamic society. With her experience and TEFL Certification she would obtain a position at Prince Mohammad bin Fahd University in Al Khobar, Saudi Arabia (Eastern Province—next to the Kingdom of Bahrain) teaching Advanced Communications and Writing to female university students. She works from 1pm to 6pm, 22 contact hours a week in the classroom. And she is saving about $2500-$3000 a month, living comfortably. Her family was supportive again, although they raised questions about how she would feel about wearing an abaya (traditional female dress in Saudi Arabia), and possibly the hijab (headscarf) and niqab (face veil) all the time. They also felt Christina might feel restricted not being able to drive a car, or to participate in certain social activities that in Saudi Arabia are typically reserved for males. Her friends even worried she’d be blown up in some terrorist attack. But not everything in life is about money and hijabs. Like many others, Christina found love in a place where she least expected it. 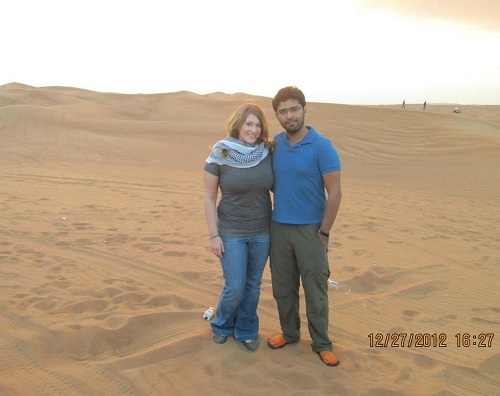 One doesn't usually think of Saudi Arabia, a nation where genders are segregated in almost every aspect of public life, as a place to find love romance, but after meeting that "special person" through a mutual friend, Christina is now happily in love. 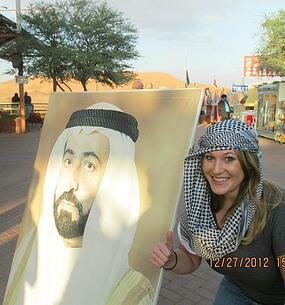 “He was really enthusiastic about showing me everything about Saudi Arabia, and brought me traditional Arabic food. We became best friends within the first couple weeks, and romantically involved soon after. We realized we were in love when I went back to America for a month, and got stuck there for the whole summer, not being able to be together. We’ve been dating for almost a year now, and it’s looking like many more. Now that I’m living in Saudi Arabia, I’m focusing on the Middle East and Africa. My life continues to surprise me more and more with every passing year”. 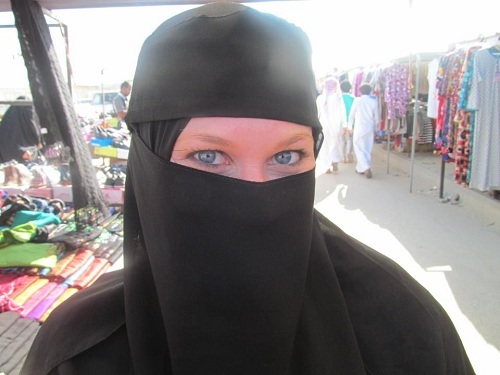 After more than three years teaching English and traveling abroad, Christina plans to continue working in Saudi Arabia and is at work planning more trips for her upcoming vacations. At her last count, she has been to 44 US states, and 28 countries, and can't wait to visit more. Christina is one of thousands of who discover the world teaching English abroad each year. 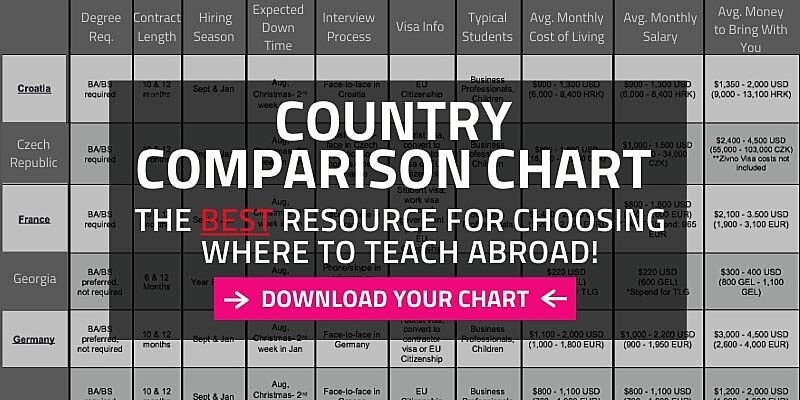 What are the benefits of teaching English abroad?